Junior $10.00 $10.00 After 2:00 p.m.
*Additional discounts are available to those with a Par55 membership. 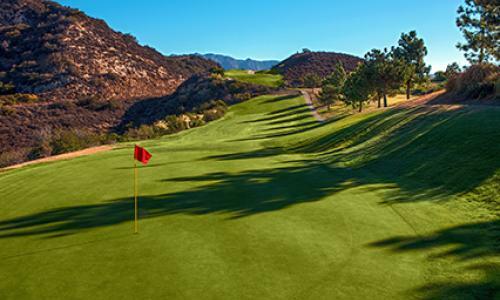 Located atop the rugged Verdugo Mountain Range in Glendale, California, the School Canyon Golf and Tennis Club offers you exceptional golf and tennis facilities at an affordable price. The club features a William P. Bell-designed golf course that is consistently rated among the top mid-range courses in the country. Facilities also include a full-length 32-station driving range open from sunrise to 10pm daily, with the exception of Monday, opening at 10am, and Sunday, closing at 8pm for maintenance. The last bucked is sold one hour prior to closing. PGA professionals will help you develop and hone your game, and ten lighted tennis courts for passionate players are available until 10pm daily. With panoramic views that stretch to the Pacific Ocean and overlook the Los Angeles basin and San Fernando Valley, Scholl Canyon is a wonderfully situated sports complex in Southern California.